For this season of giving, Manor College held several initiatives during the month of November to show their thanks and to serve those in need. Earlier this year, the college opened an on-campus food pantry, Bird Feed, that serves as the catalyst for these campus-wide giving programs. Part of Manor College’s mission is to provide opportunities to serve the community, and this holiday season offers just that. The Manor College Student Senate President, Kaitlyn Donaghy with Dean of Students, Allison Mootz standing in front of the Fill the Foyer donations! Over 500 pounds of donations were collected for the Manor College food pantry, Bird Feed. Allison Mootz, Dean of Students said, “The Manor College Student Senate brainstormed creative and fun ways to receive donations in honor of Hunger and Homelessness Awareness Week and came up the idea to ‘Fill the Foyer’. They were inspired by Villanova’s campaign to fill their bus and they thought this would be a visual reminder to students, staff, and faculty that there is a need for food both on and off campus.” Items collected for Fill the Foyer will support Bird Feed, as well as help provide items to fill Thanksgiving baskets that our Early Childhood Education Club is putting together. These Thanksgiving baskets will be filled with everything need to prepare a traditional thanksgiving meal, and will be given to students who has expressed interest in receiving assistance this holiday season. All other items collected will be donated to The Breathing Room. Members of the Early Childhood Education Club with Dr. Cherie Crosby have a packing party to make 10+ Thanksgiving baskets for Manor families in need. 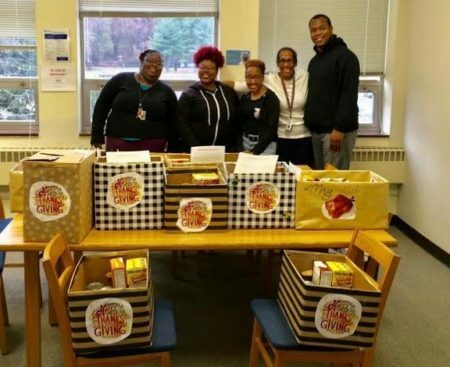 The Fill the Foyer challenge collected over 500 pounds of non-perishables and the ECE club made 10+ Thanksgiving baskets – overall, Manor College was able to help many students and families in our community this Thanksgiving season! 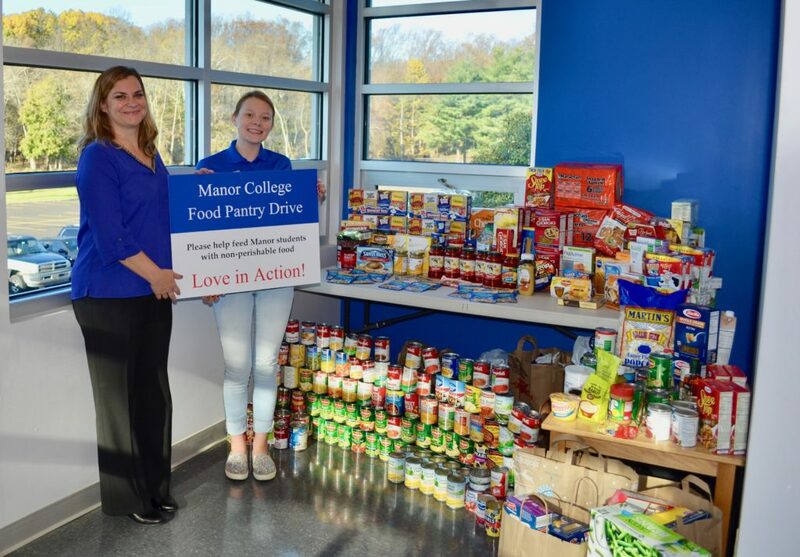 In addition to these food drives and food collection initiatives, Manor College has started a #ManorThanks campaign which highlights statements provided by the community about what they are most thankful for.